When run, the application described in this part of the tutorial simply shows a window with a title bar containing some text. When importing the Handy module, it is important to specify the version of the API that will be used. We use a Handy.TitleBar as the title bar instead of directly using a Gtk.HeaderBar widget. Handy.TitleBar makes it possible to use animations between headers in the title bar, although in this case we only use a single Gtk.HeaderBar widget. The window is shown using the show_all method so that both the window and its contents are displayed. See the Building the Applications and Packaging the Applications sections for information about building, packaging and running the application. This part of the tutorial showed how a Handy.TitleBar widget to hold a standard Gtk.HeaderBar. 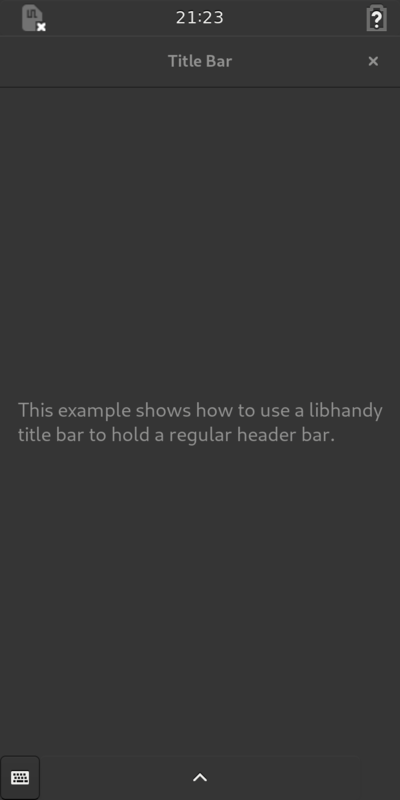 The Handy.TitleBar is set as the title bar instead of setting the Gtk.HeaderBar directly. It is not necessary to use a Handy.TitleBar to hold a single widget. However, by using one, we lay the foundations for later parts of the tutorial.